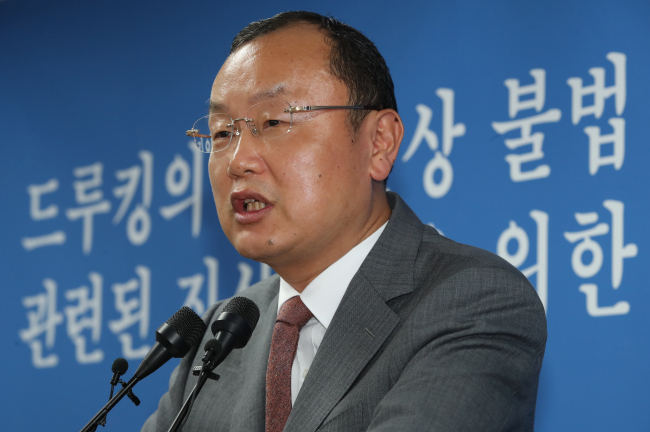 The independent counsel investigating the “Druking” scandal is to focus on shedding light on the suspects’ wrongdoings, including whether they threatened the late Rep. Roh Heo-chan. Roh, a member of the minor Justice Party, died by suicide Monday, days after it was alleged he had illegally received political funds from an organization run by Kim Dong-won, the main suspect in the case who is also known as Druking. According to the suspect, Roh received 50 million won ($44,000) from his organization in 2016. Roh initially denied the accusation. However, he wrote in a note found after his death that he received 40 million won from Kim and his associates, but that no illicit favors nor promise of such were given in return. With a threatening Twitter post made by Kim coming to light, Roh’s death has raised suspicions the suspect may have been threatening the late lawmaker. In a message posted in May last year, after the presidential election, Kim implied he would attack Roh, former Justice Party leader Sim Sang-jung and Rep. Kim Jong-dae of the same party. The Twitter post has since been deleted. In addition, special counsel Huh Ik-bum and investigators are said to have come to the conclusion that Kim and his associates attempted to gain leverage over politicians, and plan to focus on the related issues using the evidence they have gathered. The investigation had initially relied heavily on Kim’s cooperation, which, according to reports, prompted him to cooperate only in matters that he considered advantageous to his case. However, the situation has reportedly changed since the special probe was launched on June 27. According to reports, the investigators are said to have secured sufficient evidence and witness accounts from members of Kim’s organization to continue the probe without relying on his accounts. An official with the team told the local media that Druking’s cooperation is no longer needed, and that sufficient evidence is in hand so it would make little difference whether he chooses to remain silent. The independent probe was launched following revelations the suspect had attempted to influence public opinion by manipulating exposure of online comments on selected news stories. It has also been alleged that Kim attempted manipulation of public opinion ahead of last year’s presidential election with the tacit approval of South Gyeongsang Province Gov. Kim Kyoung-soo, a close associate of President Moon Jae-in.